About three months ago, I went to the field with my counterpart to do some research and give our farmers orange sweet potato vines. We are now working on harvesting the sweet potatoes, and working with them to add value to the raw product. In September 2017, I visited one of the more disadvantaged villages with whom we work. Everyone was so excited because today was the day we were going to harvest the sweet potatoes and see how they have grown! We were so excited to see some extremely large sweet potatoes growing in the field. Together, we cleaned, cut, and dried the sweet potatoes. Everyone was thrilled to see the fruits of their labor so far, but we weren't done yet. We had the idea to cut the potatoes into small pieces and then fry them into chips. After the chips cooled, we packaged them so they could be sold. The project brought many smiles to the community members and the enthusiasm was priceless. The selling of the packaged sweet potato chips has continued, and has helped the local community make a small profit. 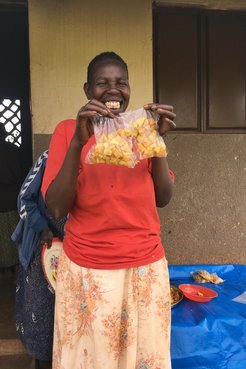 Although the primary goal for growing the sweet potatoes is to improve the community's diet by adding the nutritional value from the newly introduced crop, the profit from the selling of the chips is an added bonus. Everyone has enjoyed the fruits of their cooking! Being a part of the sweet potato project from start to finish is a truly rewarding feeling and I enjoyed myself every step of the way.